Well, once again the lack of posting has been due to my work on another paper for my systematic theology class. This paper, however, has not been an ordinary paper – I may have the coolest professor ever! He decided for this last paper to let those of us who have a creative bent use that creativity for this 3rd essay. The class has the option to write an essay (like normal), record a piece of music, paint, sculpt, or whatever else one can come up with to creatively explain the doctrine of the Trinity. How much fun is that??? I jumped all over this! The Lord gave me a creative way to express the Trinity for this project. I’ll be painting 3 different paintings to capture each Person of the Trinity, but I’ll be combining them in a creative way to express the 3 in 1 concept of the Trinity. I’ll be posting each painting as I complete them. So you’ll get a little art and a little doctrine all at the same time :). 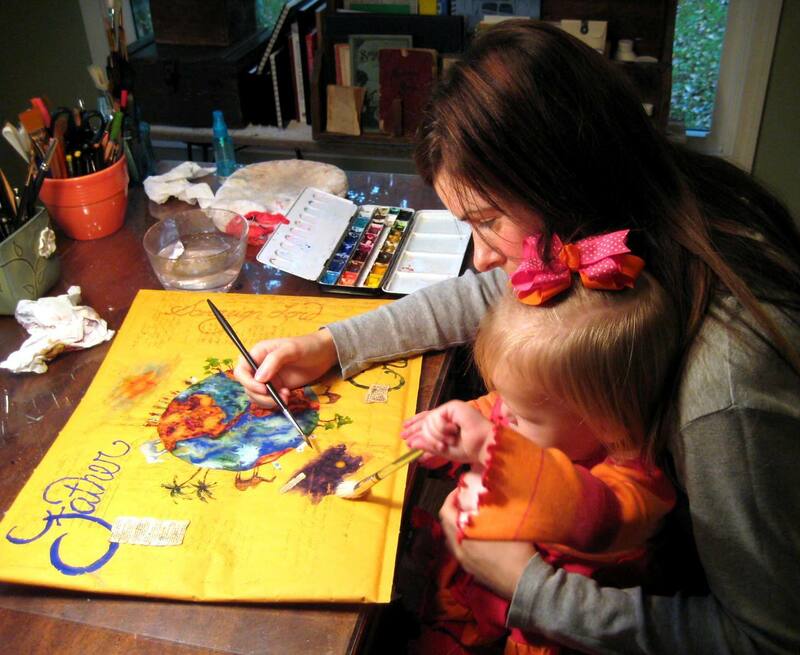 Below is a picture of Hannah (my niece) and me working hard on this essay (of course Hannah is just “play” painting). Can’t wait to see the paintings! So are you working on a masters or something? Thanks Jonathan – I’ll be posting the first one soon. Yes, I’m working on a masters degree. Susan, that’s my kind of teacher too. However, this project has taken me WAY longer than I expected – MUCH more work than writing a paper. You’re too kind – I do hope I get an A though! Christy, thank you!!! You guys are cracking me up with the A+ comments (but Dr. Carter I do hope you are reading these comments!). Yes, Christy that was great seeing you 2 weeks in a row since we had not been seeing each other for so long. Amanda, I hope Hannah liked seeing herself on the computer! Aidan is probably wondering where his picture is :). Yes, I am reading these comments! Although I’m not a prophet or the son of a prophet, I foresee an A+ coming your way! Based on what I’ve seen here and there, you’ve got it in the bag! That’s funny! But you’re really not supposed to be looking at this until I turn it in! You’re cheating! As I suspected, you made an A+ on your Trinity project! And you made an A for the class! Thank you for using your creative gifts to showcase our marvelous and unique God. Your conception for this project ~ using envelopes of different sizes inside of each other ~ is brilliant. Even more, your painting is thoughtful, precise, colorful, symmetrical, and beautiful. There is nothing in this project that is random. Everything has a purpose ~ from the Scripture references to the titles for each Person to the selection of hymns. Your artistic creativity and skill is certainly displayed in this project. There is much more I’d like to say about your work. But for now, let me tell you that I am proud of you and your painting. Keep blessing others with what you do so well. You’ll be painting more for me next semester, right? 🙂 Please tell Grady that I’ve enjoyed meeting him and having him with us in class. Well goodness Dr. Carter, what a great surprise to get this very encouraging comment from you!!! And YIPPPPPYYYY that I made an A! !Thank you for giving me the opportunity to do something like this – it really challenged me and was a lot of fun to work on. I also want to thank you for a GREAT class – I gained a ton from this class and I’ve incorporated my Systematic Theology book by Wayne Grudem into my quiet time and am going to finish the book. I recommend it to anyone – it’s a GREAT book and it’s on “pea brain” level which is what I need 🙂 – anyone could read it an understand it and gain MUCH from it. Thank you also for letting Grady come sit in on some of the classes – he loved them and it was great to have him in there with me. We had some good discussions after each class. Ok, it kills me to tell you this, but I’m only taking hermeneutics (had to look that up to see how to spell it!) next semester. Ugggh just writing that makes my stomach hurt because I really struggled with how many classes to take – I REALLY wanted to take at least one of the systematic theology classes, but I get more out of a class when I take one at a time. What I’m going to do is continue readying Grudem’s book and read through several of the books on the reading lists from your other two classes (I would love for you to tell me which are MUST reads) in-between semesters. AND if you’ll let me, I would love to come sit in on some classes when time allows me to. Thanks again for pouring into us like you did – it truly was one of my favorite classes I’ve taken and that makes it that much harder to not be taking one of the other two classes next semester. Have a great Christmas!! !